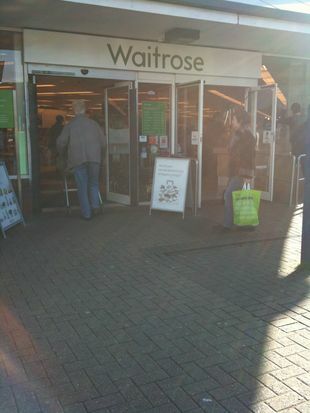 Kate was spotted shopping in Waitrose in Thatcham, Berkshire yesterday. The store is very close to her parents' home in Bucklebury and the sighting would suggest the Duchess is still staying with them while William works as a Search and Rescue pilot at RAF valley (more news on that below). I had thought Kate would divide her time between London and Bucklebury because it would be incredibly difficult for her to travel to Anglesey whilst suffering from hyperemesis gravidarum. Kate is something of a regular at Waitrose in Thatcham and there had been a number of sightings of Kate grocery shopping there in the months before the wedding. Kate wore a long blue top, a gilet and skinny jeans with boots and wished Lisa a very Happy New Year. No photos were taken, but it was a very exciting sighting for shoppers in Thatcham. It's nice to hear Kate is out and about, although obviously not well enough to travel yet. 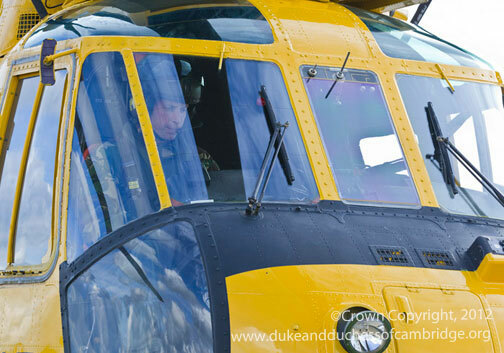 While we were all ringing in the New Year, Prince William was on a 24 hour 'readiness state' shift when he and three fellow Sea King crew members flew out of RAF Valley on Anglesey, North Wales to aid in a rescue mission to find a 41-year-old man, Paul Morris who had been sent into the water by a wave. 'Prince William and his team braved 50mph winds to provide light for the lifeboats thrashing around in the 5ft waves below. The RAF helicopter was called to the scene a few hours into the new year and spent 90 minutes searching the waters off the coast of Blackpool, but were stood down due to the weather'. Very sadly, searches have been unable to recover Mr Morris and "there are no further searches planned." Terrible news indeed which puts the spotlight on how challenging the job of an RAF Search and Rescue pilot truly is. I imagine it is heartbreaking to be called off from a search knowing the missing person has not been recovered. "It's great because you get to go out and save someone's life - hopefully - or at least make a difference to someone when you know they're in trouble. You do everything you can to try and get there." 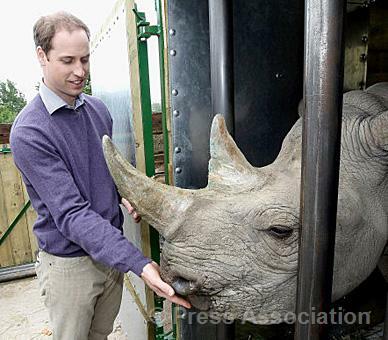 In other news, Prince William has demanded action to protect the rhino following a record number of killings in 2012. The Lewa Wildlife Conservancy in Kenya, where William proposed to Kate in 2010, reported five rhino killings in just two weeks. "The Duke is concerned that action must be taken now to stem the tide before it is too late and these magnificent creatures become lost to the wild forever." As planned, I have reopened my general blog The Royal Digest. I aim to cover all interesting stories on royal families from around the world with a look back at iconic royals and biographies. In our most recent post we took a look at the tremendous work currently being done by Princess Charlene of Monaco's foundation. This evening we'll be reviewing a movie about Grace Kelly and tomorrow we'll have our first 'Royal Profile' looking at the life of The Countess of Wessex. I hope you'll a drop by and share your suggestions! So happy to hear you are relaunching The Royal Digest! Looking forward to it. With Ella Kay back, this New Year is off to quite a restart! Hopping over to The Royal Digest right now - thank you Charlotte - can't wait for the feature on the Countess of Wessex!! Great pick me up - thank you. Great post! Thanks for your great blogs! Looking forward to following both. Congratulations on all your success! Boy! Do I have a great deal of learning and catching up to do! All this royal watching has slowed my knitting down dramatically. It can be an addiction. I need to get back to my knitting too. My son is in Charleston. Loved it there when we saw him. I just read about a widespread fire in Berkshire, which has caused a health alert. I had presumed that Kate was not in Bucklebury until I read your post. Do you have any updates--on the fire and/or Kate's whereabouts? As far as I know Kate is currently with her parents in Bucklebury. We would definitely have heard if the Middleton family were affected. A pile of 1,000 tons of agricultural fertiliser the size of a football field in Bucklebury, Berkshire, where the Duchess's parents Michael and Carole Middleton live in a £5m house caught light in late November, leaving smoke drifting over the village and surrounding farms. The Royal Berkshire Fire and Rescue said crews had failed to douse the heap, and it will have to burn itself out in a process that could take at least a month. Villagers have been warned to stay indoors, keep windows closed and protect themselves against the fumes as firefighters warned substances within the heap could release particles that could irritate airways, the skin and the eyes. Hi, Charlotte! Thank you for this great post! I'm curious... Is there any royal talk about some upcoming engagement soon? I'm missing engagements! I posted a comment on your first post at The Royal Digest but for some reason it wasn't published. And nor did the other comments on the following posts. Hi Ana, I didn't receive those comments, Could you try to leave another one and we'll see if it works? Thank you! Ana I forgot to mention there is no talk of engagements at the moment. It's good to hear that Kate has been out and about around Berkshire. The Middletons are such a tight family, and it's wonderful that Kate is able to maintain that closeness. She's in good hands while William is away at work. Congratulations on the relaunch of your other blog, Charlotte. I especially look forward to your post on the Countess of Wessex. Sophie is such an underrated royal. Quiet, loyal and kind, it's no wonder that she's very much adored by Her Majesty. Thank you Dash, Sophie is one of the most underrated royals in my opinion. She has really come into her own and her story is fascinating. I too can not wait for your post on the Countess of Wessex. She is beautiful just like our Duchess and we don't here to much about her. And again thank you for this great post. Any idea when William will be back to his Duchess? It must be hard on both of them to be apart during this exciting time in their life. I just hope she get's well enough to be able to go back to Wales with William. Hi Pauline, I actually heard William is trying to clock up his flying hours, with 24 hour shifts I'm sure he will be spending time with Kate shortly. Hi Charlotte Pauline and Dash, I have always seen good things (news) about Sophie. I have followed her through out the years. She would probably be a great mentor for Kate. The pics of little Lady Louise and. Kate at the Olympics are adoreable. I am looking forward to reading up on and learning about Sophie also. I am just curious why we don't see their son, James, out in public? We always see Lady Louise, especially since she was part of William and Catherine's wedding. Am I just missing him? I know he just turned 5, but you just don't see or hear much of him. Not 100% sure (from what I've read so far) on the Waitrose sighting. As far as I know, there has been no confirmation sightings from anyone else; and the person who saw her - and apparently Kate - wasn't with anyone else. Not saying it didn't happen, of course and I am prepared to be persuaded otherwise. Three other people confirmed the sighting. I message one of them to confirm the info on what Kate was wearing etc and it was an exactly the same as Lisa's account. That must have been extremely hard on William and all involved trying to save that mans life. My condolences to the family. The lose of a life is an agonizing thing.
. Nursing my hubby from the flu. I'm sure Carole Middleton is doing the same with Kate in and out of sickness. Glad Kate can pop out it's such a bummer drag pain in the arse. (how ever you put it -from what ever country your from) being tied down. My husband is going nuts. I wonder what Kate has planned for her birthday, if anything as it is a little later this month. I look forward to following you with your other blog Charlotte. Glad my comments are finally working from my iPhone now I had been having problems posting but it looks to be back to normal now :) hope you had a lovely Christmas and new year. Wonderful news Grace. A couple of other readers have been experiencing the same problem, I hope it's resolved for them now. I'm glad that Kate is staying with her family. It's the best place for her right now while William is working. I do agree. Surrounded by family in her home town is exactly what Kate needs right now especially while feeling unwell. I doubt we will get a sighting! For Kate's birthday some year, it might be fun to pick a photo from each year since she met William. I've saved some photos and it's quite interesting to watch her development. Also at some point, it would also be fun to do one on Kate and dogs. There have been at least three viewings of a golden retriever or golden cross that must belong to the Middleton's. He or she showed up at Polo in September 2006, then in Scotland in 2009 and finally (looking rather old but still active) running with Kate at Christmas 2010. Everyone loves Lupo but it would be nice to have a look at his mysterious predecessor. Glad to see Kate's out and about! Maybe she's feeling better and her second trimester will be better than her first. When I was in England this summer, a friend and I headed out to drive the countryside and stopped for tea at Polly Tea Room in Marlborough. We walked up and down High Street and stopped off in the Waitrose there. It was pretty quiet and low-key compared to our big super stores here in the US. I loved it! I am sure after being so ill, something as simple as going to the store must be exciting. It said she was alone, but I am sure there would have been her PPO's with her right? Charlotte, I read an article today that said William is buying a country home for Kate's birthday. The article read he's looking in Hampshire or Buckinghamshire. I know you can't believe everything you read, but wondering if you had heard anything from your sources? Hopefully she and William can celebrate together since William has been working in Anglesey. Glad to know Kate's being well taken care of by her family. I am looking forward to seeing what wonderful post you have to celebrate Kate on her big day! What are the chances of a sighting?!?!? !